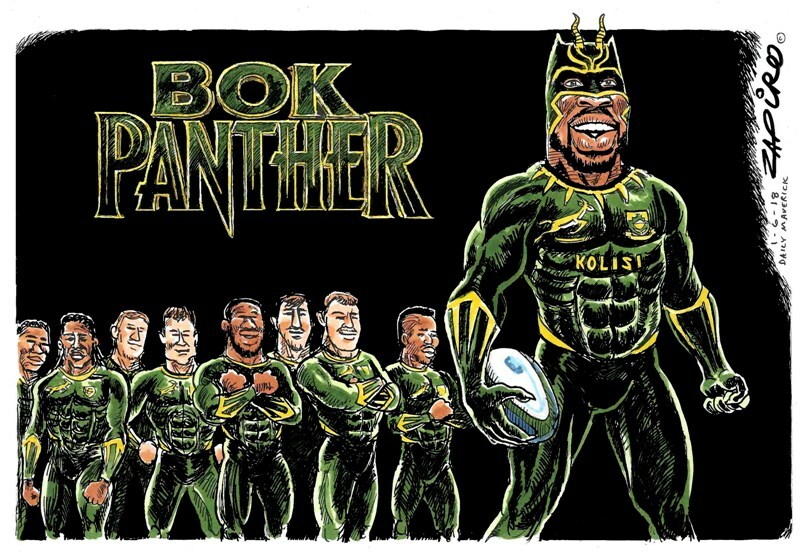 Bok Panther. More of Zapiro’s brilliant cartoon work available at www.zapiro.com. Siya Kolisi’s inspirational rise from a childhood in the Zwide Township in Port Elizabeth, South Africa, to become the first black Springbok Test captain has won the July Laureus Sporting Moment of the Month competition, after a vote by thousands of sports fans around the world. Leading the team against England at Emirates Airline Park in Johannesburg in June, Kolisi wore the iconic No.6 jersey, the same number worn by President Nelson Mandela, the first Patron of Laureus, at the historic 1995 Rugby World Cup Final, at the same venue, which South Africa won. Kolisi now becomes the fifth Nominee for the Laureus Sporting Moment of the Year, joining March winners and ski jumping legends Sven Hannawald and Kamil Stoch, April winner Doddie Weir, Rochdale football star Joe Thompson, who won in May, and June’s winner, Chinese double-amputee Xia Boyu who climbed Mt Everest. Each month, from March to December, the public can select their favourite Moment from a shortlist of four videos, chosen by the sporting legends of the Laureus World Sports Academy. Monthly winners will then go head-to-head in a final public vote, with the winner being announced at the 2019 Laureus Awards Ceremony. The Laureus Sporting Moment Award demonstrates qualities such as fair play, sportsmanship, drama and dedication, and looks beyond the scoreboard or podium. They are emotional and inspirational moments, symbolising the true value of sport and bringing to life the message that sport has the power to change the world. To view these emotional and engaging Moments and to VOTE for your favourite, visit myLaureus.com. Sports fans can also send videos that they have seen and enjoyed to myLaureus.com and they will be considered for shortlisting in future months.